Ambulance Victoria ran out of ambulances and had to call in police officers, firefighters, non-emergency patient vehicles and field doctors trained for disasters to help with transporting acutely ill patients to hospital. Ambulance Victoria was flooded with more than 1900 calls between 6pm and 11pm – more than six times their usual workload – after a storm hit Melbourne shortly before 6pm, prompting a "major disaster response" from emergency services. "We were seeing asthma in people who had not experienced breathing issues before." Hospitals across Victoria were left reeling, with depleted supplies of asthma spray Ventolin reported, and emergency services battled to respond to calls for help when rain and strong winds churned up pollen, dust and other irritants. The demand was so great that Ambulance Victoria ran out of ambulances and had to call in police officers, firefighters, non-emergency patient vehicles and field doctors trained for disasters to help with transporting acutely ill patients to hospital. Mr Stephenson said he even worked through the night, treating patients. 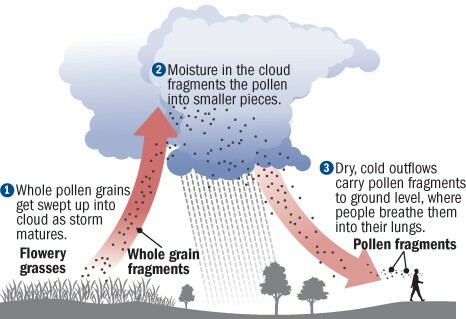 Is “thunderstorm asthma” a new thing?